Turf is the layers of grass laid down as an excellent, efficient and aesthetic way to transform your untidy or worn-out lawn. Only a few tools are required, and turf can be laid all year round, however, spring is ideal with frosty conditions and extended periods of hot and dry weather best avoided. The two main factors that achieve a lush green healthy lawn are excellent quality turf and good soil preparation. Wayne’s Landscaping & Excavation are experts in providing, preparing and laying down of turf, so you can have that dream yard all year round. 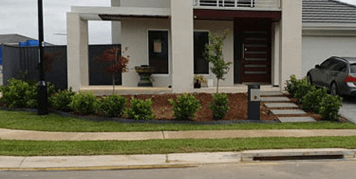 Whether you’re looking to add quality turfing as part of your new home landscaping project, or redesigning your yard after excavation, our lawns are so good you’ll enjoy watching grass grow. As tempting as it can be to lay your own turf, the truth is it can be time-consuming and can costly without the right equipment. On top of this there’s the risk of your turf drying out dying should it not be laid properly or quick enough. Sometimes, it pays to hire the professionals to do the job properly, efficiently and at an affordable price. With Wayne’s Landscaping having over thirty years’ experience in laying turf, we can provide the grass of your dreams without a price shock nightmare. You know what you’re getting when you hire Wayne’s Landscaping services. Unfortunately, there are too many unlicensed cowboys out there undercutting quotes to win the job, only to over-promise and under-deliver once they’ve got the job. Wayne’s Landscapers are no such cowboys. 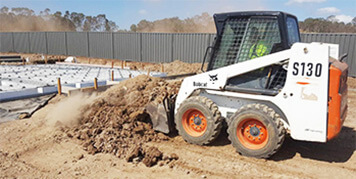 For us, the customer is number one and delivering on our promise is crucial to maintaining the solid reputation that Wayne’s landscaping has cultivated for over thirty years in the business. Although DIY might seem fun and save you a few bucks, the truth is if you don’t know what you’re doing it will be incredibly time-consuming. Not to mention the risk of injury and the cost of hiring equipment. Sometimes it pays to let the professionals do the dirty work. After all, you don’t want to spend your weekends watching grass grow! Measure the correct amount you require. Once you have worked the area out add between 3-5% on top to make up for any off-cuts. Better to have a little too much turf than not enough. You will need to first remove your old lawn if you are replacing it. This is where a turf cutter comes in handy. Mowing the lawn beforehand will reduce the volume of material that requires rolling and lifting. It is important to make sure that you set the cutting depth so that it removes the layer just underneath the old lawns’ surface. It is important to cut in straight lines otherwise you will miss a lot of thin strips that have to be removed by hand later on. So, cut the strips of turf in one-meter lengths or less, roll up and dispose of. Any bigger and they start to get too heavy. Think of it as turfing in reverse! The ground will most likely be compacted so the soil will require breaking up. This will allow oxygen into the soil and encourage deep rapid rooting of the turf. This can be done with a rotovator. Rotovate to a depth of about 20 cm. Then start to level it out with a rake. Flatten down the ground with your feet by walking over the soil. This will prevent it from being uneven after you’ve laid the turf. Leave the ground to settle for a few days before you adding a pre-turf fertilizer. This will add nutrients that the soil might be lacking and help the turf development. Only order the turf once your soil has been prepared as the turf must be laid within 24 hours of being delivered. When turf is rolled up the leaves of the grass are not receiving sunlight and will quickly start to turn yellow and eventually die. Start by laying the turf along a straight edge. Then roll out each turf close to the next. Don’t walk on the newly laid lawn. When you need to cut the turf use secateurs to make clean cuts in the grass. Once the last roll is laid stand back and marvel at how sweet your new lawn looks… but you’re not quite finished yet! Immediately after laying, the turf will need a very good watering. We recommend using a water sprinkler. You will need to keep the turf moist until it is firmly rooted but don’t over water. Morning and in the evening are the best times to water. Try not to walk on the lawn for at least 2 – 3 weeks. Then as soon as it starts to grow cut it. Mowing helps encourage growth. Wait six months when grass is well established before using lawn care products. Laying your own turf takes dedication and care to ensure you don’t waste your hard earned money. Not looking forward to a weekend in the yard? Reach out and speak to a member of our friendly team and we’ll get our hands dirty for you instead! 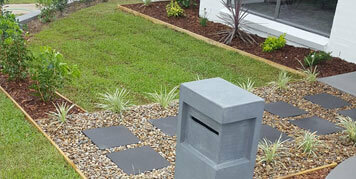 We recently had Wayne’s Landscaping do a turf job in our backyard in Campbelltown. In short, they did a great job. From the fixed quote to the turfing to the follow-up, they were prompt, polite and professional. Our lawn looks great and we couldn’t be more stoked. We recommend them to anyone! After the initial consultation, we knew Wayne’s Landscaping was our choice. From the moment we set up an appointment, there was a strong sense of professionalism. Wayne explained everything in detail and took us through the process, step by step. It’s only been a few weeks since the turf was laid and it’s already looking green and healthy. Very impressive. I asked 3 companies to give me quotes for turfing our large new backyard. 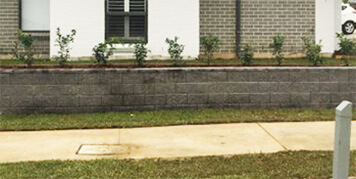 Wayne’s Landscaping & Excavation is the most professional and trustworthy in town. I was very impressed with Wayne’s professionalism, knowledge, and integrity. Superb service that I’d recommend to anyone. After speaking with a few neighbours they recommended Wayne’s Landscaping. We received several quotes from other grass companies & Wayne’s was by far the most knowledgeable, genuine and friendly company. I’d recommend to everyone looking for a great grass company that will go above and beyond to make you happy. This is how service should be. Wayne’s Landscaping was fantastic. I love the grass and the service was awesome. I recommend them to all of looking for turf, they do it the right way. Thank you to Wayne and his workers. 1. What is the thickness of turf for preparation of the area for laying? When preparing for a new lawn, you will need to allow for at least 30 mm for your turf slabs to sit on top of the existing soil. This enables the lawn to sit at the correct heights, especially when laying turf alongside paths, driveways and garden edging (which will normally determine your levels). 2. How much topsoil should we put down? Lay 50-100mm of topsoil before laying your new turf. 3. When is the best time to lay turf? Any time of year. Just bear in mind the hotter and drier the season the more you will need to water your new lawn. 4. How long can turf stay on a pallet before it needs to be laid? Your turf should be laid within 24 hours of receiving it to prevent the root systems drying out. This is especially so in the warmer months. The sooner it gets laid the better for a healthier lawn in the long run. 5. When can I give my new lawn its first mow? The first mowing usually takes place within three weeks of laying, depending on the season. Your new lawn will take root faster during spring and summer. Looking for a good indicator of whether your lawn is ready for a mow? Just grab hold of the turf and see if you can lift it. If you can’t lift, you can mow it. We suggest giving your lawn a watering straight after the first mow and don’t let your lawn get too long before its first mow. If your lawn is in quite a bit of shade, it could be left a bit longer prior to the first trim. 6. A what height should a lawn be mowed? You should mow your grass at 35mm height, which is usually the 3rd or 4th notch from the bottom on your lawn mower. The shadier you lawn, the higher the mower height required with mows less frequently. 7. How often should I water my new lawn? 8. Do I need to top dress my new lawn? Not necessarily. If your new turf is properly laid or has been professionally installed by the team at Wayne’s Landscaping and Excavation there is no need to top dress. Top dressing is used to repair your lawn due to poor nutrients, levels or a bad lay.